For those who don’t know what “no poo” is, it is basically finding other methods of washing your hair without using shampoo….yep no shampoo. The most popular form of “no poo” is water only, or WO. It is a great alternative if you want to avoid chemicals and toxins found in conventional shampoo, especially if you are sensitive to sodium laureth sulfate or other common chemicals in shampoo. There are also other methods of “shampooing” that work for the no ‘poo movement: apple cider vinegar, baking soda, cornstarch, arrowroot powder, and many other miscellaneous treatments. Some just use less shampoo, but that’s not really giving up shampoo and it doesn’t give the same benefits. For a long time I had wanted to give this a real try, but every time I did, I gave it up shortly after because my hair immediately felt gross, greasy and sticky. I tried twice before doing a water only hair washing method, but was not pleased with the results. Over the last month though, I’ve come across multiple articles where others were doing no poo, but they used a regime of baking soda and apple cider vinegar. I hadn’t tried this before, but after reading about the many benefits I decided to try it. What are these BS and ACV “no poo” solutions? Use, but not at the same time… unless you want to make a hair volcano. 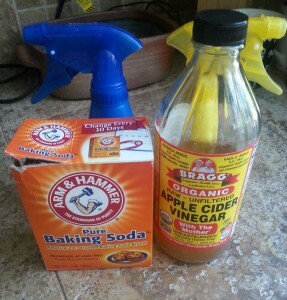 The baking soda and apple cider solution, as I have come to know them, are usually made by adding about one cup of water to a tablespoon of baking soda or apple cider vinegar. The preferred water is usually distilled water or spring water, the preferred baking soda is usually aluminum free, and lastly, the preferred apple cider vinegar is usually raw, organic, unfiltered and unpasteurized, apple cider vinegar with “the mother” which contain enzymes and good bacteria. 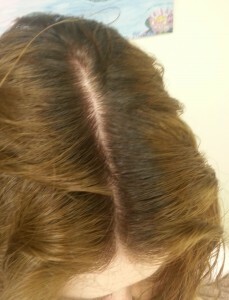 First the baking soda solution is used on the hair, fully washed out, and then the apple cider vinegar solution is used and washed out. The first day felt fine. It was bearable but different. It wasn’t the same texture left in my hair as before, so I thought that maybe it could work. It felt more like a light waxy texture. My hair didn’t look bad, but not great either. I kept on it for a couple more days, washing my hair every 1-2 days, and it seemed as if my hair got more and more waxy and weird. I had to go to work and even though I had just washed my hair and it had air dried, it looked visually oily and disgusting. I had no choice but to do something, and quick. I tried some dry shampoo on my hair in order for it to look better. It did the temporary trick, but it obviously isn’t a permanent solution. I washed my hair using the same BS + ACV solutions, but scrubbed harder and longer. That didn’t seem to help at all. Somehow, my hair came out worse than before and looked worse than ever. I used the dry shampoo again and tried to think of a solution. What made matters worse was that over the last few days I have had sudden terrible acne on every area that touched my hair. Furthermore, my husband began to get terrible acne on the areas of his face that touched my hair. Then today when I was washing my hair, I first used the baking soda and water solution, and then noticed how gross my hair felt. I used the apple cider vinegar water solution and it didn’t seem to change the texture of my hair. My hair just felt like it was sticking together like I had applied glue. It felt like this the last few washes, but more this time. I was desperate to change this waxy texture. I tried using Dr. Bronner’s Castile liquid soap, which is still pretty natural, but that didn’t seem to help. I gave in and tried conventional shampoo, but that didn’t help either. I then realized that the baking soda and water solution was causing the texture I hated so much. I am now going to try going no poo without it, using just the apple cider vinegar one. I’ll let you know trying no poo without the baking soda goes.